Do you want a better life? It not only is possible, it is achievable. And it is within your control. What you need is an approach to living that is simple, not simplistic. Practical, not theoretical. Guiding, not confining. 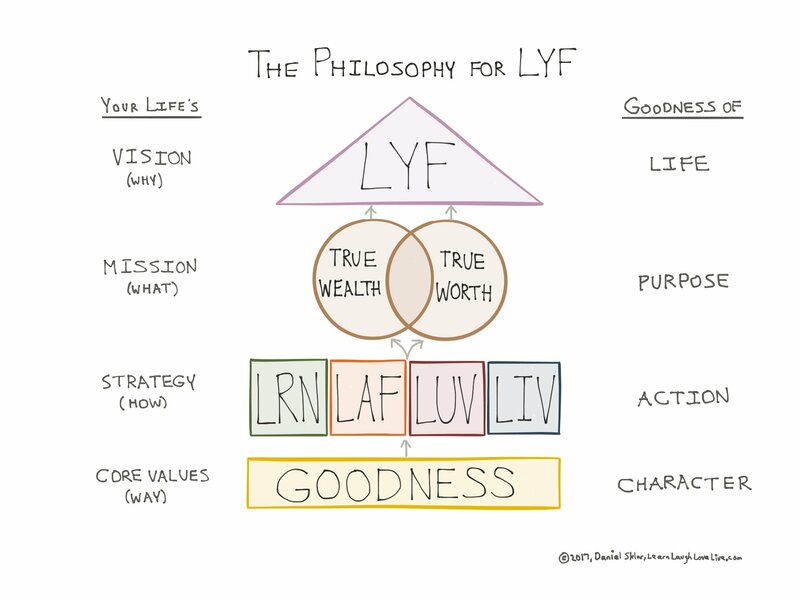 The Philosophy for LYF describes the key concepts critical to a better life, and it presents a clear path to experiencing your better life. When you implement it, you will continually be improving your life, enjoying your life, valuing your life, and realizing your life's potential. When you implement this philosophy for living even at the most elementary level—simply learn, laugh, love, and live more—you will notice an improvement in your life. When you take it a step further and implement the four deeds of goodness at their deeper levels by interconnecting them, applying them both inward toward self and outward toward others, and making them everyday habits, you will begin experiencing an elevated life, one marked with wisdom, joy, purpose, and attainment of your potential, all arising from your life’s true mission: to grow true wealth for yourself and give true worth to others. The Philosophy for LYF and some of its key concepts are depicted below. To learn more about the philosophy, click the arrow button below to read the next topic or click on any of the topics below.